Paul Possibly Vincent's most fascinating work was Wheat Field with Crows. Even though three popular motion pictures dealing with Vincent's life (MGM's Lust For Life, with Kirk Douglas as Vincent, Robert Altman's biopic Vincent & Theo and the whimsical low-budget fantasy Starry Night) all indicate that this was Vincent's last painting before his suicide, many scholars insist that it was not. However, it was painted in July, 1890, and if it was not his absolutely last painting, it was certainly was among his last -- and when I look at the ominous, threatening sky, the sinister-looking black birds swooping down to devour the ripening grain, and the three roads leading to -- nowhere, I can't help but feel that Vincent knew the end was near when he painted it as a cry of pain and desperation as his already precarious mental state worsened. So what do you think? Even if this was not, in fact, his very last painting, was it nonetheless a "visual suicide note?" I like your description of Wheat Field with Crows -- very evocative --, and your way of looking at the field as though you were seeing it through Vincent's eyes, adopting, to view it, what you imagine was his tortured mind-set at the time, as he was painting it. I like what Altman did with this painting, too; or with the crows and wheat field, simply. It's interesting to think that, by dint of trying to capture this field in his work, Vincent came to love it enough to want to die in it. You know, it's like how, once we tell someone we love them, we become even more attracted to that someone, much more so, even, just because we spoke the words to them, those three little words (we believe to be true), enchanted ourselves with them. Some would have it that a lot of Christians project their sadness onto Christ, and that, worshipping Him, they worship their own sadness; worship themselves, really, finally, simply. Probably a lot of Vincent's "followers" do this with him and their sadness, too, don't you think? Of course more "evolved" followers, fans, can find a lot more to admire in these men than their (own) sadness. Robert Satterfield Dr. Satterfield offers some interesting observations about two works: Starry Night and The Night Cafe. None yet. David Brooks Over the course of the last four years or so, I've received four or five e-mails from people with a very similar question: "Did Van Gogh ever paint/draw a series of works with cats in them. Cats which appear more aggitated, more electric as Van Gogh's mental state detriorates?" Regarding the question of cats...as a small issue...there is the black cat in one Daubigny's Garden and yet another cat under the pool table in Gauguin's version of the night cafe....this might be confused by some as a work by van Gogh, for those who do not know the difference. I have been reading your forum page about Van Gogh and have an additional answer to the question about the series of paintings about cats. I think the misconception that the Louis Wain cat pictures were by Van Gogh could be because of a Life Science Library book called, "The Mind." It was part of a collection of encyclopedia books about various subjects and in "The Mind" there is a section dealing with mental illness and art. In that section there is a page on Louis Wain's cats and a few pages later there is an entire section on Van Gogh. I think people saw the cats pictures when reading the book and in their mind combined those pictures with Van Goghs. There is also a picture of Munch's "The Scream" a page after Van Gogh, another painting many mistake for Van Gogh's. And this book also perpetuates the myth Wheat Field with Crows was Van Gogh's last work before his suicide. The book came out in the sixties and maybe people read it as a kid and years later made these wrong connections. I hope this helps. malcolm@longmeadow.fsnet.co.uk I am studying a degree in art history, and I am particularly interested in Van Gogh. However in recenct discussions, one question troubles me, to what extent was Van Gogh's work the creations of an intelligent and highly educated mind? My immediate response is yes, taking into account aspects such as colour theory and his breadth of knowledge and understanding of the art world and its traditions etc. Although clearly thereis other evidence against this, mental condition etc. If anyone has any views on this subject, I would be very interested. None yet. 2) where in Dordogne did Jean Dauberville live? I assume "La Bachellerie" refers to a private residence." After undertaking some research, Mr. Shepard is able to answer his own questions and comes up with some interesting information. Iman Iman is actually a very curious three year old girl and her parents passed along an excellent question that has been puzzling this young art critic: "We have a beautiful poster of "Vincent's Bedroom in Arles" in our dining room. My 3 year old daughter constantly picks apart pieces of this work and questions every aspect of them. The one question she wants to know that I cannot answer is 'Who is Van Gogh's friend in the other picture'? She is referring to the two portraits on the bedroom wall. Could you please answer this question for us so that we can satisfy her inquiring mind?" David: It's a very good question. The self portrait shown on the left in the painting is clearly F 525, but I'm not familiar with the portrait of a woman to the right. Is this a lost painting? Can anyone help to answer this inquisitive three year old's question? Laima shares her thoughts on Iman's question. George Torrieri There is a Van Gogh quotation which goes something like "I had a dream about religion, than I went out and painted the stars". Do you where I can find the exact quotation? I remember that Carl Sagan used this quotation in his foreword to "Cosmos", but I can't find Cosmos as it's several years out of print (unsurprisingly, the quote and the "Starry Night" paintings are quite popular with astrophysicists...). The quote is from a letter from Vincent to his brother, Theo. And it does me good to do difficult things. That does not prevent me from having a terrible need of--shall I say the word?--of religion. Then I go out at night to paint the stars, and I am always dreaming of a picture like this with a group of living figures of our comrades. Bob Harrison Bob Harrison and David Brooks had an e-mail exchange which raised some interesting questions. This exchange is shown below and we would welcome further insights that anyone could offer. Bob writes: Hi David: If you recall, some months ago we talked about the implications of a sentence in letter 506, and at the time I expected the difference to be a simple "sa" or "la" vielle famme. 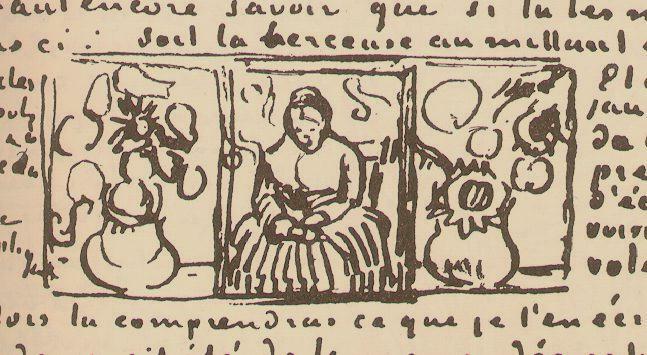 I have finally tracked down the French version, and to my astonishment found that the text reads "...qu'il y a encore celui de la mére Tanguy (qu'ils ont vendu), de leur ami...." This can only be interpreted as "...he also has that [portrait] of Mother Tanguy (which he has sold), [and the portrait] of their friend." I find it somewhat disturbing that even Dr. Hulsker ignored this clear statement in his database of the paintings while including some works with much less information, let alone the clear statement that at least two of Vincent's paintings had clearly been sold (one for 20 francs!). The friend could have been JH1201 or 1200, or a lost work, and would also give a more solid attribution to JH1216. David replies: Hi, Bob: Well, I think that you make a very good point and have come upon something quite interesting. I think that it's interesting, too, that JH 1216 has such a weak provenance. The De la Faille 1970 lists it as suddenly "appearing" at the Thannhauser Art Gallery in Munich. Well, what about before that? I'd be interested in finding out some more history of the work (if any is to be found). Stacey Are you familiar with the poem "Starry Night"? "long as I paint, I feel less mad.....the brush, a lightning rod to madness"
I cannot for the life of me recall the author, or even the rest of the poem. it is quite a powerful bit of prose, imo. and I would love to find it again. Enrique Pareja comments: I have not heard or read this particular poem but Julio Iglesias has a song "Starry Night". There is another song from Alberto Cortés, in Spanish, the name is "A man with only an ear" (el hombre de una sola oreja) where he talks about Vincent. David Brooks Walther and Metzger list Morning: Peasant Couple Going to Work (F 684, JH 1880) as "Whereabouts unknown: presumed destroyed in the Second World War". They include a colour reproduction which is extremely sharp and of excellent quality. Were there many good colour photographs taken of Van Gogh's works around 1940? Colour photography existed, of course, but wasn't widely used. Also, even if there was a good colour photograph taken, wouldn't the colours have faded over the last half century? Similarly, The Painter on His Way to Work (F 448, JH 1491) also shows a good quality, colour graphic, but is also said to have been destroyed in World War II. Can anyone confirm this? Jerry Romanek sheds some light on the issue by passing along this provenance information. Recent update: I'm going to leave this question for now and Jerry's answer because they're both of interest, but a recent e-mail from a visitor has solved half of this mystery. Morning: Peasant Couple Going to Work wasn't destroyed at all, but rather is now in the collection of The Hermitage in St. Petersburg, Russia (along with Portrait of Madame Trabuc and Valley with Ploughman Seen from Above--F 727, JH 1877). The Van Gogh Museum in Amsterdam confirms. But half the puzzle remains. How about The Painter on His Way to Work? Lou Grove The lovely portrait of La Mousmé, Sitting (F 431, JH 1519)--a girl in a red and blue dress is in the National Gallery of Art, Washington D.C. I love this painting and have visited it several times. I have a small framed print hanging in my home. My question is regarding her hands. Both appear somewhat elongated--the right hand more than the left. But the left hand appears almost withered--deformed, somehow. Does anyone know the story behind this? Jose Navarro has these comments. Gwendol Bowling of Albuquerque, New Mexico has some thoughts to share as well. Bev Darling I have a favorite Van Gogh painting, Irises (F 608, JH 1691). In fact, I have the mouse pad AND wallpaper. I work at a Renaissance fair in Massachusetts and have some friends who are into all kinds of art. One of them knows I'm a Van Gogh fan, and he mentioned that he'd seen a PBS piece on Van Gogh a few years back. One of the interesting items in the piece was the story of the meaning of the one white iris. He couldn't remember the reason, but said it was fascinating. Just curious . . . it's my favorite piece of art. If you should ever come across the story, I'd be interested. Jose Navarro submits some symbolic interpretations, while Paula Grove takes a more pragmatic approach. Anyone else? from Colorado How many and which paintings did Van Gogh sell during his lifetime? I know the myth is that he sold only one, The Red Vineyard. But I recently read that Theo recorded selling one other painting of Vincent's. Does anyone know which one this other painting is? David Brooks notes: It's a good question. The story about The Red Vineyard is well known, but I seem to recall that Vincent was commissioned to do a series of paintings representing the four seasons years before. Also interesting is a (perhaps apocryphal) story I heard which mentions that Theo sold another of Vincent's works shortly before his brother's suicide, but for some reason neglected to mention this sale to Vincent. Does anyone have more information about this? Recently, Jose Navarro and I had an ongoing e-mail dialogue about this issue. To complicate matters further, the 1970 De la Faille catalogue raisonné of Van Gogh's works suggests that The Red Vineyard wasn't, in fact, sold until 1891--a year after Van Gogh's death. David Andrews Can anyone give me any information regarding the relationship between Van Gogh's religious beliefs and his paintings? Jose Navarro shares his comments. Robert Waech What do you know about the relationship of the stars in Starry Night to the actual configuration of the stars in the night sky. Is there any controversy on this subject? Adam Stead wonders if a biblical, as opposed to an astronomical, interpretation might be worth considering: "During my research I found another interesting aspect about the stars. There are eleven stars present in the sky and the sun and the moon seem to be represented as one. This scenario directly parallels the Biblical story of Joseph. Could van Gogh's distribution of the stars be completely arbitrary and a deeper, more symbolic meaning be the motive?" The astronomical possibilities have produced a great deal of discussion, however, so I've devoted an entire page to it. And finally, Andrew Land is looking for some related information: "I'm trying to find an Owen Gingerich Sky & Telescope article on Starry Night. Can you help, I don't have even an approximate date I'm afraid!" Karen Spencer I was wondering if anyone knows how Van Gogh thought his paintings should be displayed (in what grouping). I believe it was Emile Bernard who mentioned Van Gogh wanted his paintings to "sing by placing it next to another; to place a color scale of yellow next to a scale of blue, a scale of green next to a red". I am starting a collection in my home and thought it would be fun to try to arrange it the way Vincent would have wanted it. Karen follows up: I received one answer that said Vincent thought the paintings should be put up and taken down with the seasons. I also just read that "Vincent suggested that his brother flank La Berceuse with two canvases of the sunflowers, like a triptych--"then the yellow and orange tones of the head will gain in brilliance by the proximity of the yellow wings." Andrea I am a college student doing research on Van Gogh. I am looking for information about his use of colors, the blues and golds. I heard one time that these use of colors have some sort of meaning. I cannot find anything with any reference to it. David Brooks comments: There's a lot of room for discussion about Van Gogh's use of colours. I do explore Van Gogh's use of complimentary colours on my page analysing Still Life: Vase with Irises Against a Yellow Background, but additional insights are most welcome. Edwin Blom I have a copy of Vincent Van Gogh's Bulb Fields ("flower beds in Holland" in other sources). I would like to know where exactly in Holland this painting was made by Vincent in 1883. None yet. An even more cloisonnist handling of shapes went into the striking imagery of a seascape resulting from [Van Gogh's] visit to Saintes-Maries-de-la-Mer. Boats on the Beach at Saintes-Marie-de-la-Mer, June 1888. The three beached boats may allude to local folklore, which annually celebrated the arrival of three Biblical Marys in AD 45 to convert Provence. The middle boat is named "amitié" (friendship). The boats flatly painted in spectrum hues allude to Japanese prints, but the much more painterly sand, sea, and sky flow and eddy with broken tertiary colours. In addition, Donnel Miller-Mutia writes: "The painting 'Fishing Boats on the Beach at Saintes-Maries-de-la-Mer' became the focus of my academic thesis, which explored on Vincent van Gogh's spirituality, which is reflected in his interest on these themes: water, boat & fishermen. Feel free to see my blog at http://vangoghsea.blogdrive.com."